A high-performance, professional grade elastomeric flashing and repair product that cures to a long lasting rubber-like film. Remains flexible through extreme temperature ranges. Its non-sag property and exceptional adhesion makes this an ideal cement for the construction and repair of flashings, metal joints, seams, coping, vent pipes, skylights and chimneys. 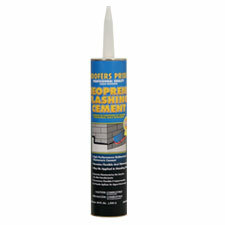 Ideally suited for sealing cracks, holes, and tears in built-up roofs and modified bitumen single ply. Trim nozzle to desired bead size. Puncture foil at innerbase of nozzle. Using a caulking gun, apply to a minimum wet thickness of 1/4”. Allow at least 24 hours to dry (70°F and less than 50% humidity with no rain) before applying a surface coating. Use above or below grade. Coverage will vary with thickness of application but will approximate 30 lineal ft. per cartridge (1/4” thick.) Clean up tools and hands with waterless hand cleaner. High performance, professional grade elastomeric flashing and repair product that cures to a long lasting rubber-like film. 61439 10 oz. Tube .85 lbs.